Hello again my lovely readers! 🙂 I know all of you have just been itching to read another movie review! And so…here it is! Last Saturday, my family and I went to see Dolphin Tail 2 in theatre. Excitement flowed through me as I eagerly awaited the start of the movie…all the while gobbling up a box of Reeses Pieces! (I have braces, alas, and so I must temporarily forgo popcorn for chocolate and peanut butter! Not too bad of a trade though…;)) With the lights dim, and a hush over the room, the movie began! And what a wonderful, family film it was! 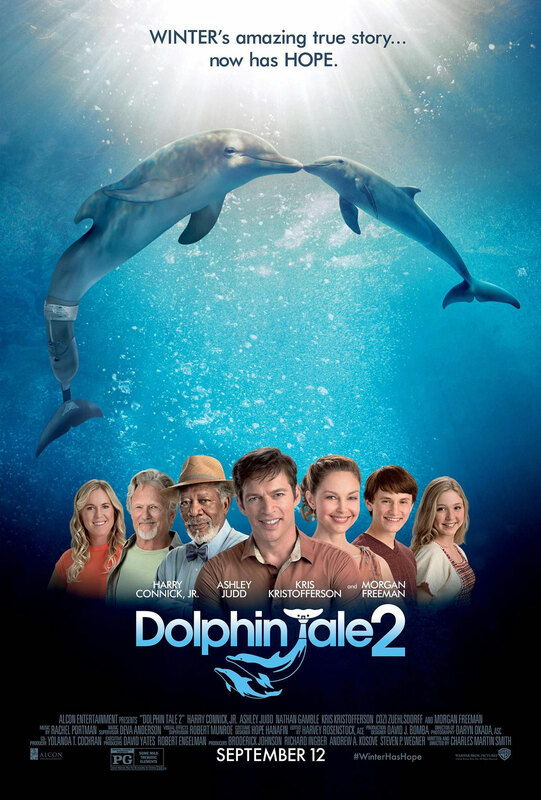 If you have seen the original Dolphin Tail, then rest assured you will love the sequel. Returning to the screen, are all of the characters from the previous movie – Hazel, Sawyer, Dr. Clay, and of course Winter! Continuing the dolphin’s journey, we learn that Winter’s beloved companion – Panama, has died. Although this creature had lived a long life, it was nevertheless quite shocking and difficult. Interestingly, it was Winter who had the hardest time with Panama’s death. And so the search is on for a female friend for the tailless sea-animal. In their facilities, is Mandy…a female dolphin who was brought in because of a sunburn and other wounds which I shall not name. At this point in the movie, I immediately start to think – why what a wonderful turn of events! They can pair Mandy with Winter! At this time, Mandy’s injuries have in fact healed. The people at the aquarium are now at a crossroad. Do they risk losing Winter? Or do they release Mandy back into the wild? The decision of what to do weighs heavily on everyone, at last one is made: Mandy will be released. As our hearts are torn in happiness for Mandy yet grief for Winter, we remain unaware that hope (pun intended;)) will soon be here. Towards the end of the movie, Dr. Clay gets a call regarding a juvenile, female dolphin. Could this be the companion Winter has been waiting for? Hazel and the others seem to believe so, and the young dolphin is then named Hope. Although Hope did not accept Winter at first, curiously, when the prosthetic tail was put on, the younger dolphin did not have an issue with the older one. All in all, this film was wonderful and had a great ending! If you have not seen it, I definitely would recommend for you to go and watch it. As you go about your day this week, remember to cling to the hope which Jesus gives.